do you ever read the missed connections section of craigslist in your city? i read the new york section pretty regularly, not because i think i’ll ever find myself in the posts (though i did, once, and the guy said, and i quote, “you’re pretty, and i appreciate that you knew every word to that killers song, but that’s not enough to make me break up with my girlfriend.”), but because they are just so damn romantic sometimes. this one is cute, right? We sat in adjacent seats, yours looking at mine, starting at Broadway-Lafayette, where we both got on. It was a little before 5 on Thursday. You were (are) blonde, New Yorker-reading, Rag & Bone bag-carrying, lovely-armed and -legged. I got off at York Street, you didn’t. But you looked. I am intrigued. i’ve posted a missed connection or two in my day – one of which got the above response about the killers, and one of which went unanswered (guy on the 1 train from 23rd to canal, if you’re out there, call me). it’s been a while since i’ve considered posting one. but there’s this guy who lives in the building next to mine. i know this because we used to take the m23 bus together, crosstown, every morning at 7am. he’d be dressed in nice pants and a tucked in shirt, business-like, finance, i’d guess. he carried a briefcase. i’d be dressed in my lulu pants and a ratty t-shirt, sans makeup, hair in a bun. for the first six months, we didn’t speak. he’d graciously let me onto the bus before him (ladies first) sometimes, and he’d look up when i arrived at the bus stop each morning, but no words were exchanged. still, though, there’s a strange kinship to be found between people who share the same commute. and yes i’m a hopeless romantic with a wildly overactive imagination, but i swear we had a moment. and i was too dumbstruck to do anything but smile and giggle a little bit. and then he stopped taking the bus. and now i see him, some mornings, while i wait for the 7am, in his gym clothes, heading across the street. and i wonder to myself, did he quit his finance job? did he lose it? he’s also grown out his facial hair, and man, does he look cute. the other night, i came home from soul cycle in my sweaty gym clothes and he was on the phone outside his building. and he looked straight at me, then continued to talk. so i deliberating stopped and sat on the bench outside our shared tennis courts for a few minutes, hoping me might come talk to me. but he didn’t. and i’m sure it’s all in my head, and he probably only stared at me because i was, unbeknownst to me, staring at him. but maybe, just maybe, he was hoping to talk to me too. 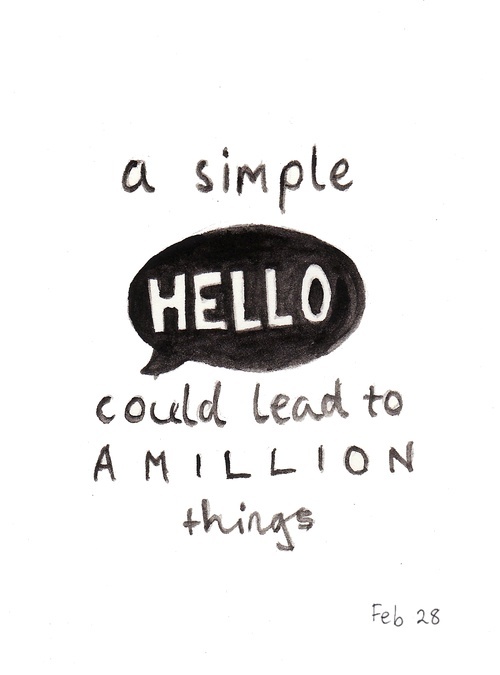 it all starts with hello, right?